Shaw, probably right around the time he started his GoFundMe. Photo: James Shaw Jr. It has been five days since the horrific Waffle House shooting in Nashville’s suburb of Antioch. That’s barely long enough for the location to have reopened, and hardly a blip on the time it’ll take the community to heal. But it’s ample time for Americans to dig into their pockets and donate a significant amount of money to the incident’s victims and heroes. 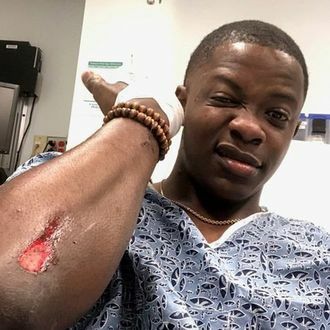 James Shaw Jr. — the customer being celebrated as “the Waffle House hero” (and, now, “Tennessee’s hero”) who saved lives by wrestling the suspect to the ground — topped his heroism during the actual shooting by setting up a GoFundMe just hours later that asked for money to give to the victims’ families. His initial goal: a somewhat ambitious $15,000. His current amount, raised after just four days: $172,822. Nearly 5,000 people have chipped in so far. The way GoFundMe pages work is, they remain live until their creators decide to take them down. Neither Shaw nor Ali has suggested plans to make their fund inactive anytime soon. That means if you want to contribute to either, or both, you still have time to do it. You can find James Shaw’s page for the victims’ families here. And Yashar Ali’s page for Shaw here.